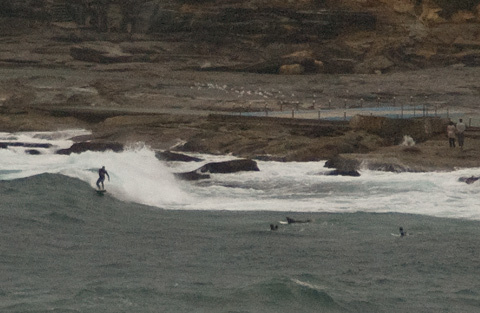 Posted in: Dee Why. Tags: E-2m-7s. Rainy again, but I managed to grab a quick snap between showers (90% chance of rain today and the outlook is for another week of on again/off again showers). The wind swell has come around to the east and the MHL buoy was showing an average size of around two metres, with a period of 7 seconds. 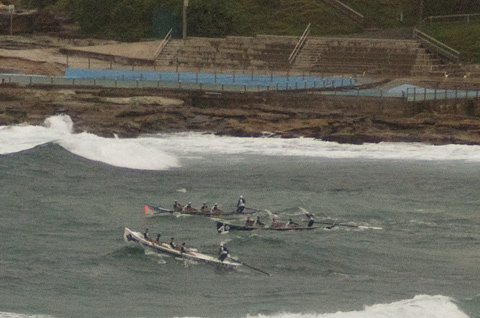 A little before 0800, the wind was out of the NE at 10-15kts but Dee Why wasn’t looking super chopped up. There were a few bods experimenting with the low energy levels and extremely doubtful water quality. The biggest wave I spotted was around the chest high mark, but for the most part it was smaller. The trans Tasman high, as the Bureau notes below, is going to keep the settings more or less the same right through the weekend. From the shape of the models, today is about the peak in terms of average wave size for the same period. Tide was high at 0500 and is currently dropping to a low at 1130-ish before rebounding again to a high at around 1715. Have yourself a top old day and stay happy as best you can! A high over the Tasman sea is maintaining a ridge to the southern Queensland coast. The high remains the dominant feature for the remainder of the week and through the weekend, maintaining north to northeast winds along the New South Wales Coast. Winds: Northeasterly 15 to 25 knots. Seas: 1.5 to 2 metres. Swell: Easterly 2 metres. Winds: Northeasterly 15 to 20 knots. Seas: 1 to 2 metres. Swell: Easterly about 2 metres. The chance of thunderstorms. Winds: North to northeasterly 10 to 20 knots. Seas: 1 to 1.5 metres. Swell: Easterly 1.5 metres. Wind is going along from the NNE at 15-20 kts this morning under grey skies. The MHL buoy off Sydney is showing two metres of 7 second east wind swell, but it sure isn’t anything like 2 metres at Dee Why. Every now and then a just barely catchable little thing flips over at the point. However if there are any waves bigger than waist high, I’d be very surprised. At around 0830, there was a single bodyboarder chasing the aforementioned bumps, and a few beginners messing around in the knee high dribble at kiddies. Obviously not the first place to check for a wave this morning. The wind is set to back off by this afternoon according to the forecast, but it seems to me to have already done so. With the drop in energy input, I’d expect the little wind swell to weaken further. The latest run of the models suggests our surf prospects in Sydney are slumping toward flatness across the middle of the week. However, the Bureau’s version of the data is currently saying we might have another NE wind swell day on Tuesday. Hope they’re right and that the other interpretations are too pessimistic. At the outer extreme of the forecasts, there seems to be hope of some longer period east swell for next weekend… wouldn’t that be good! Have yourself a good one! During Sunday a cold front will move over the southwestern Tasman Sea bringing southerly change to New South Wales southern half of the coast and a ridge on the north coast will weaken. Behind the front a high pressure system is expected to move over the southern Tasman Sea by Tuesday extending a ridge to the north coast. Winds: Northerly 20 to 30 knots tending north to northeasterly 15 to 25 knots around midday then decreasing to 15 to 20 knots by early evening. Seas: Up to 3 metres decreasing to 2 metres during the afternoon. Swell: Northeasterly 1.5 metres. The chance of thunderstorms inshore from midday, extending throughout this afternoon and evening. Winds: North to northwesterly 10 to 20 knots, reaching 25 knots at times, tending southwesterly up to 30 knots around dawn then tending south to southwesterly 10 to 15 knots during the morning. Winds tending southeasterly 10 to 20 knots around midday. Seas: Up to 2 metres. Swell: Easterly 1.5 metres. Isolated thunderstorms. Winds: Northeasterly 20 to 25 knots. Seas: 1.5 to 2 metres. Swell: Easterly 1.5 metres. Isolated thunderstorms contracting offshore during the evening. Posted in: Big Picture. Tags: 3/10, E-2m-7s. Had a look at the beach late and can report it was just as ordinary as this morning. No real sign of a substantive change to the swell settings since then either. Still fluffing along at a couple metres and 7 sec apart. Waves are extremely junky and forming and reforming in such a jumble that you’re hardpressed to get into ’em. Outlook is for the cursed wind to blow pretty strongly tomorrow, so I’m not hopeful of a quality improvement at all. The chance of showers doesn’t really brighten the picture much either. Oh, and we look like getting overhead and a bit at the very least during the peak pulses. Tuesday until midnight: Wind: E/SE 15/20 knots, reaching 20/25 knots at times. Sea: 1.5 to 2 metres. Swell: E 1.5 to 2 metres, increasing. Wednesday: Wind: E/NE 15/20 knots reaching 20/25 knots offshore. Sea: 1.5 to 2 metres. Swell: E 2 to 3 metres. Thursday: Wind: E/NE 10/20 knots. Friday: Wind: N/NE 10/20 knots. Posted in: At large, Dee Why, Mona Vale, North Narrabeen. Tags: E-2m-7s. Turned up at the beach around 0630 for a surf with a few mates. Contemplation of the conditions immediately resulted in a decision – to get coffee. 15-20 kts of ESE wind overnight turned the ocean into a choppy mess. The average period is only about 7 seconds, so you have to time it just right to get a steep enough face for a take off. If the ocean was audio, it’d be pink noise. After getting the coffee on board and sorting out the big questions of the day with the boys, it was time to head off northward for a quick squizz on your behalf. 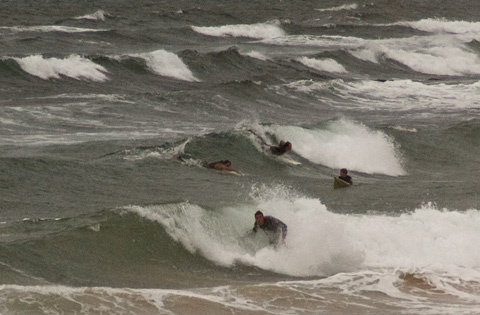 As the pictures show, the situation was only very slightly better at Northy and Mona Vale. The former looked like an awful lot of paddling for some pretty marginal payoffs. The pic is pretty typical of the sets. At Mona it looked to be less consistent but otherwise similar to the situation down south. On the latest run of the models, it appears that Thr-Fri will be the peak, but there should still be something fun left over for the weekend warriors. Go well with your day! Tuesday until midnight: Wind: E/SE 15/20 knots reaching 20/25 knots at times. Sea: 1.5 to 2 metres. Swell: E 1.5 to 2 metres increasing. Wednesday: Wind: E’ly 15/20 knots reaching 20/25 knots at times offshore. Sea: 1.5 to 2 metres. Swell: E/SE 2 to 2.5 metres decreasing. Posted in: Collaroy, Dee Why. Tags: 2/10, Collaroy, Dee Why, E-2m-7s. Couple hundred metres up the beach from the stormwater pipe at Collaroy. Got out and about between about 1600-1700 to see if I could grab a few snaps for the Saturday evening visitors. Conditions, as you can see, are still pretty ghastly. But that hasn’t put folks off. About the most intense looking wave I saw was the one above. 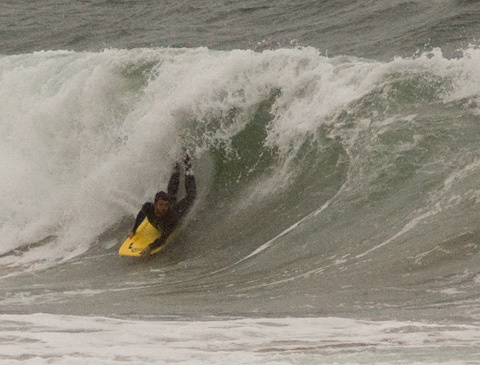 It was grinding into a shallow bank up the beach from Collaroy SLSC. About four bodyboarders on it too. Gee, you needed to be keen late this afternoon. Collaroy proper was not looking too fabo. The 15-20 kts of SE wind was chewing it up pretty badly and though the windswell is now just about east and a couple metres at sea, the period has slipped below the 8 second mark, so utter gutlessness is pretty much the story. Around the corner at Long Reef there was really nothing worth taking a snap of. Surprisingly small (guess it’s the east direction) and windblown junk making for an unsummery scene sadly. 1630: Dee Why looking just sort of rideable. Long waits, rain, wind, etc. Dee Why was only slightly better. You could at least surf there and a few bods were having a crack at the point as a small flotilla of traditional surf rescue raced out and back from the beach. The intermittent showers and wind have churned the ocean into a soupy mess. Blergh. Realistic rescue conditions for these vintage boat enthusiasts. Saturday until midnight: Wind: E/SE 15/20 knots reaching 20/25 knots at times. Sea: 1.5 to 2.5 metres. Swell: E/SE 2 to 2.5 metres. Sunday: Wind: E/SE 15/25 knots increasing to 20/30 knots later.Sea: 1.5 to 2.5 metres rising to 2 to 3 metres later. Swell: E/NE 2 to 2.5 metres. Monday: Wind: SE 25/33 knots. Tuesday: Wind: E/SE 25/33 knots.